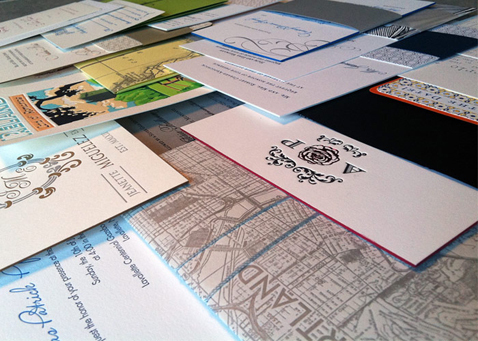 If you are not too good of a graphic artist or do not have an intimate knowledge of letterpress and foil stamp printing processes and limitations and you are out there in the market searching for the best wedding invitation store to design your luxury wedding invitations, let me get you straight, it will prove to be a daunting job for you. Therefore, to make your task a bit easier, EventManagmentIndia.com has come up with a list of the top 5 luxury wedding invitation stores in the Indian market. We will help you filter the vast online space for that one perfect place with all the perfect design, communication, customer service and printing skills necessary for your wedding invitation card. Your wedding invitations might be a box or scroll wedding cards or wood craft cards. But the bottom line is you it must have the feeling of invitation and not just the look alone. Therefore always try to customize your wedding card adding new and antique printing and finishing methods. If you want your card to look elegantly simple use a large formal size letterpress invitation with matching letterpress RSVP, reception card and envelopes, all designed around a clean balanced typography. You can always match it with ribbons, ties, envelope liners, inner and outer envelopes, calligraphy, matching postage stamps, die cut shapes for the invitation and envelopes, pocket folds and custom designed laser cut cards. Ravish Kapoor from New Delhi is a prominent designer of Invitations from India. They have clients from all over the world. He is often referred to as the ‘elegance’ and ‘style’ king in the market. He designs all kinds of cards – from weddings to anniversaries, baby showers to birthdays, and inaugurations to parties to innovative-designed personalized cards for the perfect touch of warmth and style to spice up any occasion. If you do not mind spending some Rs 495 for having an invitation card designed, Ravish Kapoor is undoubtedly the best in the market. His client list includes some of the stalwarts in the industry like actors Shilpa Shetty, Karisma Kapoor and Shamita Shetty along with fashion designer Ashish Soni and lots more. Chawri Bazar is another big name in the wholesale market of wedding cards and paper products. This first wholesale market of Old Delhi lies to the west of Jama Masjid and was established way back in 1840. They have everything you can think of, from beautiful wedding cards to attractive wallpapers to warm greetings in any type of papers required. You name it and they have it. Yes the process is exhausting, you will you be gifted with a day to remember your lifetime. You can reach there by taking the street just near the middle projection of Jama Masjid’s western (rear) wall. You can also go via Chawri Bazar underground station of the Delhi Metro. Beyon Design from Marine Lines is very classy and innovative designers from Mumbai. They are famous for their strong sense of clean design and punctual service offered in printing your once in a lifetime wedding card. They know exactly how to maintain the balance between being creative and addressing the various business needs of the clients. They are a small group but their work never compromises on professionalism. They are in the market since 2006. Chira Bazar is expensive but you totally get back your money worth. It has the old-world charm with the warm tender mix of different communities with two Agiaries, Thakurdwar, Sri Ram Mandir and the Goan Institute Building. Nestled between these landmarks is the wedding card market at Chira Bazaar. The lane too compliments the surrounding environment. The bazaar is a mix of old and new card printers apart from numerous paper and cardboard stores. It is probably the oldest store in the lane of Jayantilal Jain’s Rolex Cards. It was incepted by his father Mishrimalji Jain in 1966. The business is now handed to the third generation of the Jains family. Not only brick and mortal store, today a lot of wedding card stores has come up in the online world. With the boom in this area, most of the wedding invitation website comes on a monthly basis.